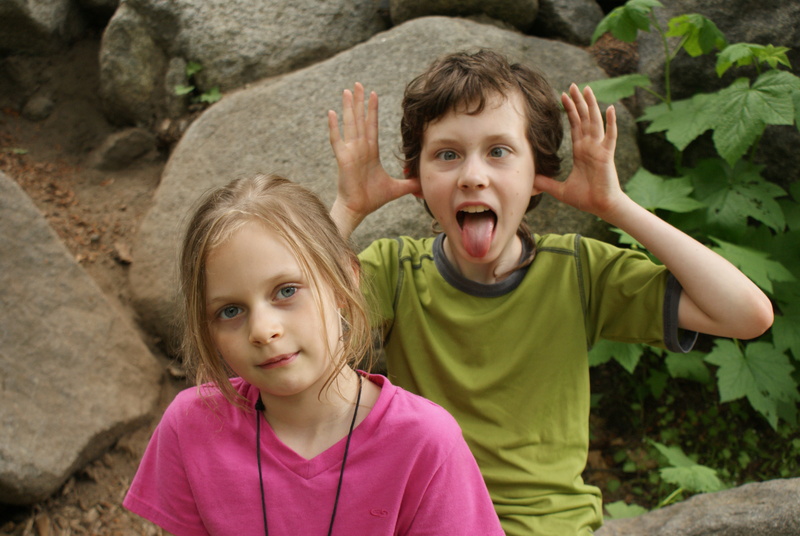 We’ve settled firmly into a weather pattern called the June Gloom here in Puget Sound, and with the end-of-the-school-year activities I’ve been going a bit crazy. A trip to find the sunshine and flowers was in order. My friend Jessie was able and willing to come with us again. 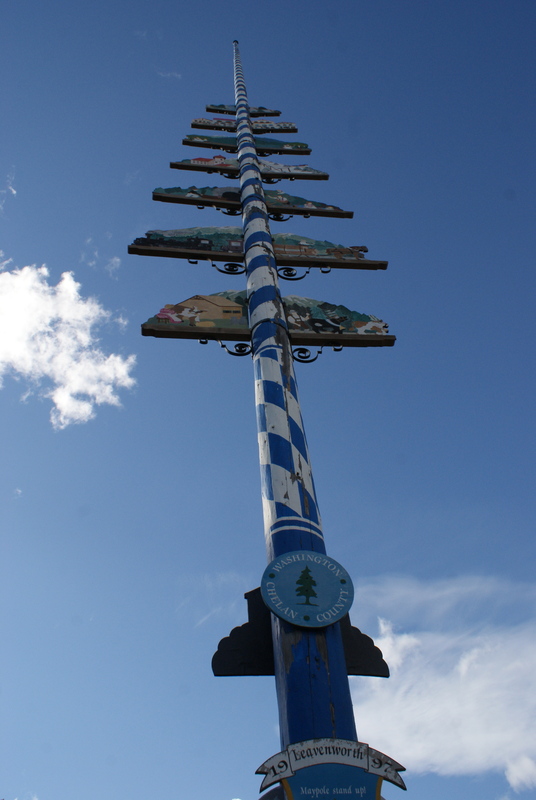 I checked the weather forecasts all week and figured the Leavenworth area was as good as any. 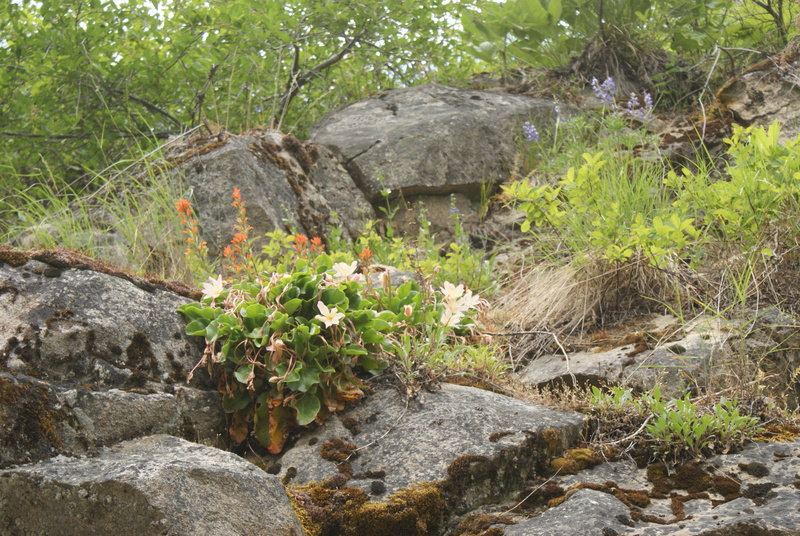 In addition, photographer and hiker Alan Bauer had posted photos earlier in the week of Tweedy’s Lewisia in full bloom. Every year I see stunning photos of this interesting plant in bloom. But I had never made it over to the area where they grow. 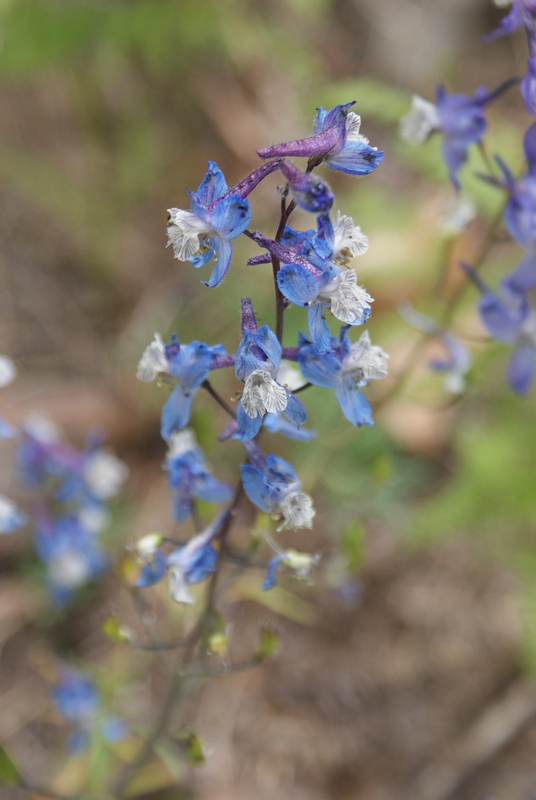 They are endemic to the Wenatchee mountain area. This year I was determined to go see them. We left the house at the respectable time of 8:30 Friday morning. Our drive was uneventful except for discovering at the Skykomish Ranger Station that I had forgotten my driver’s license. The rain was pretty heavy in the Cascade foothills. We really hoped the Crest would block that pesky rain from the area we were heading, and sure enough, it got gradually lighter and warmer after we passed the ski areas. 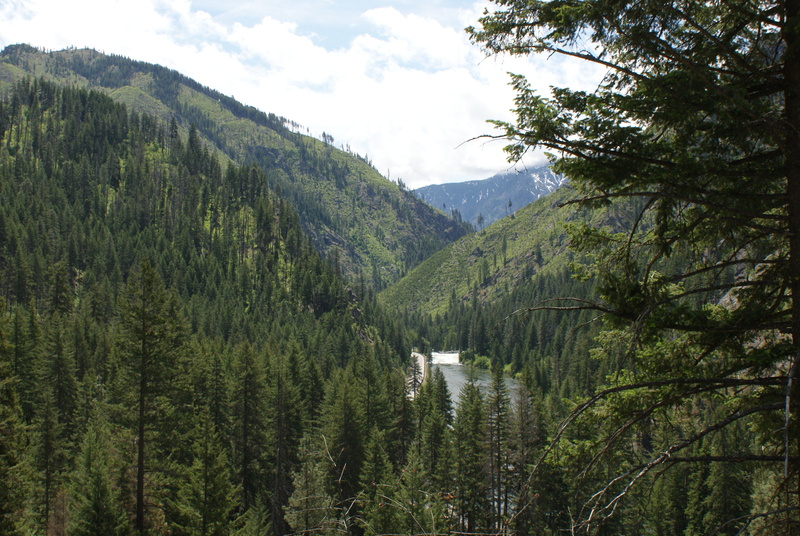 By the time we got to the Tumwater Canyon area, the sun was poking through the clouds. 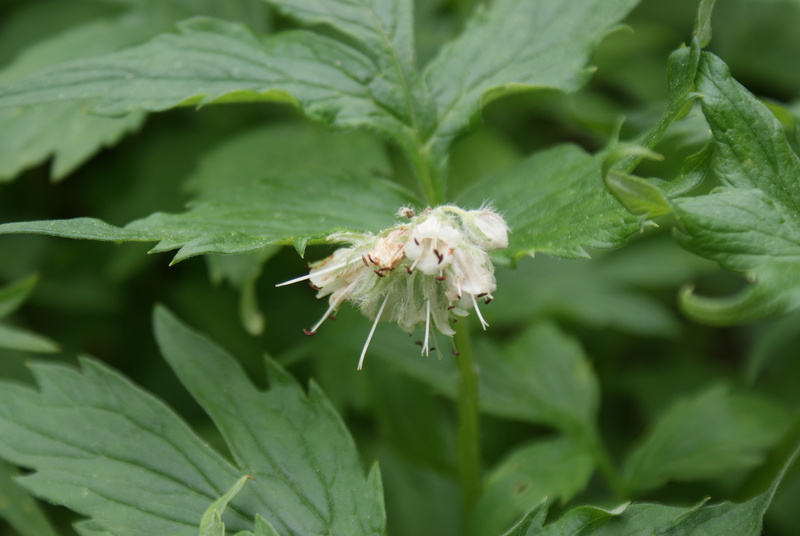 The Tumwater Botanical Area was set aside partly to protect several rare and endangered plants that grow there. There are no maintained trails; rather a network of gated roads that you can walk on into the hills. 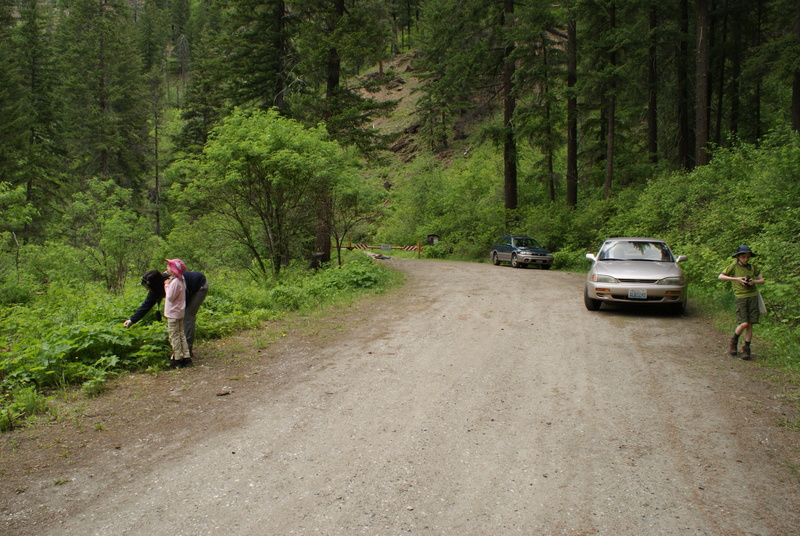 Forest Road 7903 starts about 1/4 mile east of the Swift Water Picnic Area on Highway 2. It is not currently marked in any way, but if you miss the turnoff, like we did, there is a pullout on the side of the highway just after it where you can turn around. There is ample parking on the side of the gravel road before the closed gate. Flowers and bird song begin immediately. 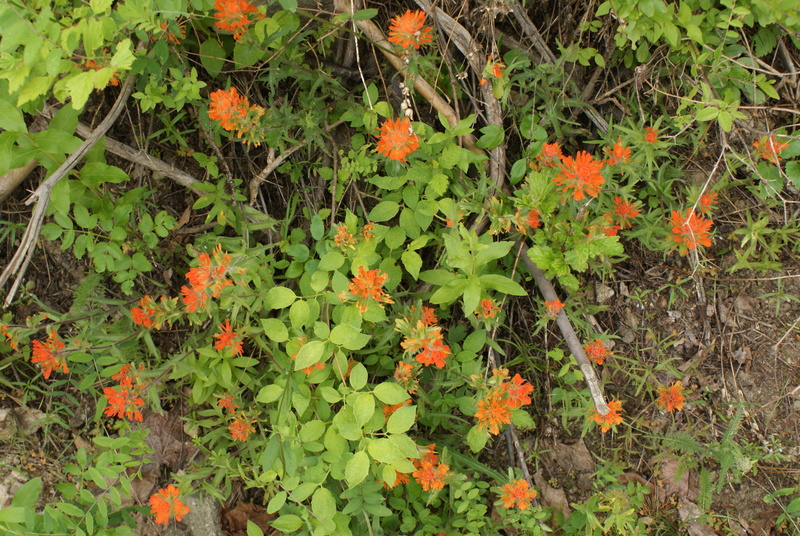 Lupine, yellow violets, and various other wildflowers bloom right along the road. Birds flutter in the bushes, singing and calling all around. 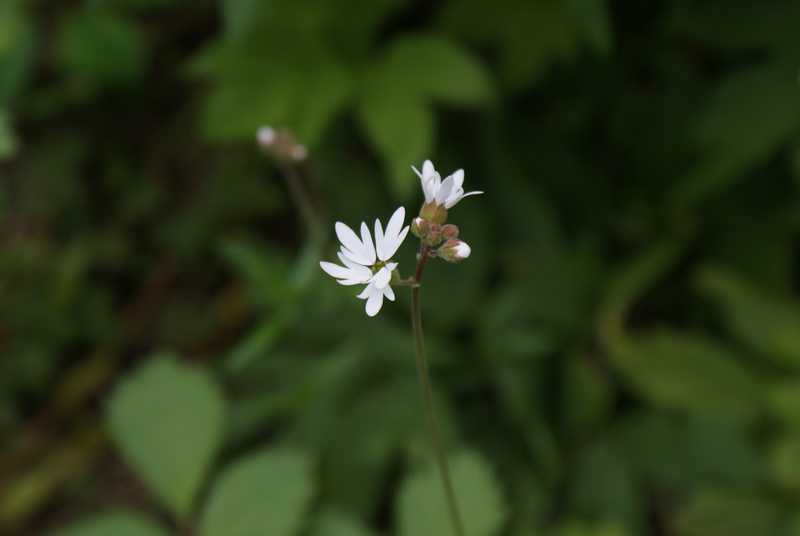 We decided not to take full packs for this part of our day; the lewisia were supposed to be only a short distance up the road. 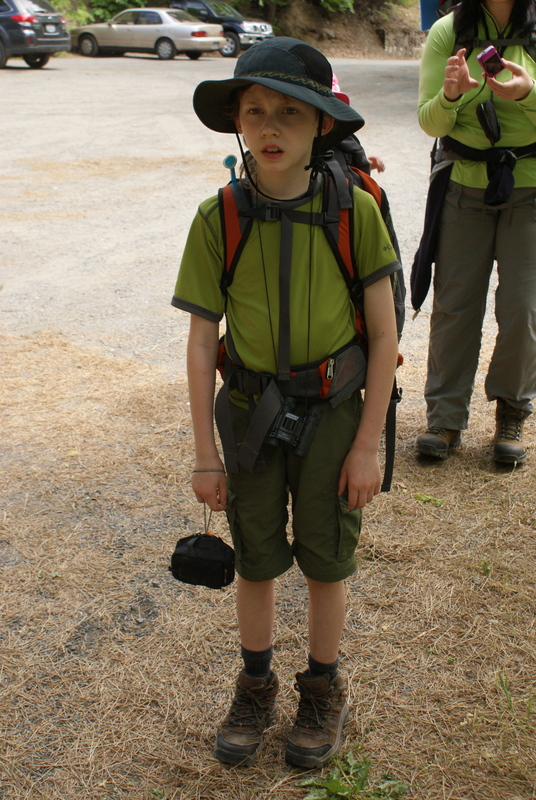 I did pack water and snacks and our binoculars and bird book in Annika’s pack, which I carried. The road climbs steadily upward. Thankfully there were plenty of flowers to give us a chance to stop and take a picture. 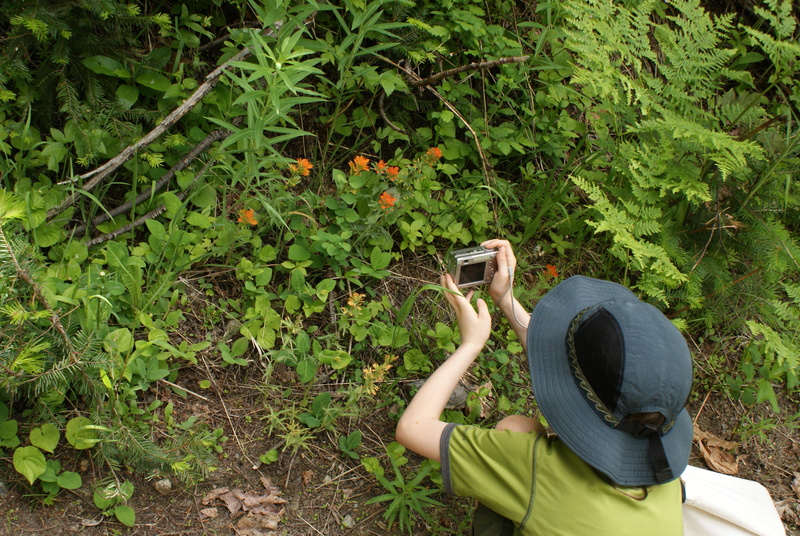 If it weren’t for the flowers and multiple species of butterflies flitting around, the kids would not have enjoyed this trail. 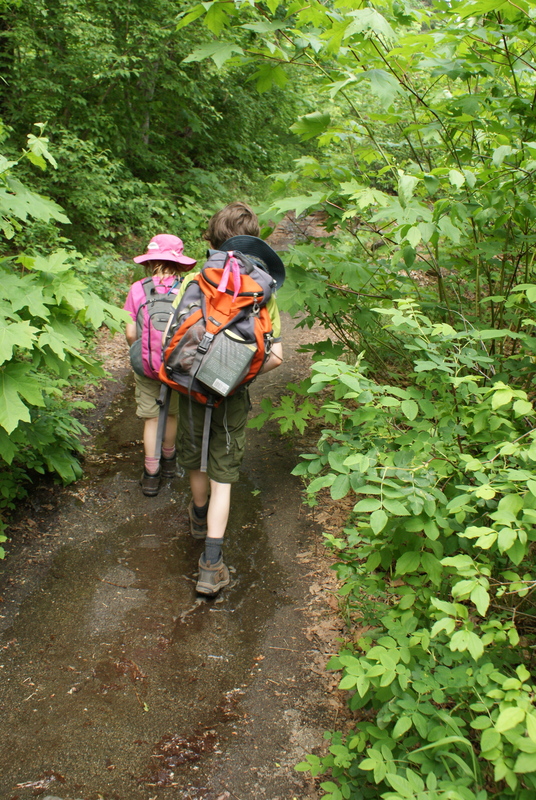 It’s dry and most kids won’t like the lack of a clear, fun, wet destination. Annika’s foot began to hurt in her new boots, but I hadn’t brought the first aid kit (the one time I leave it in the car, we need it.) I figured we were almost to the flowers I wanted to see, so we pushed onward. 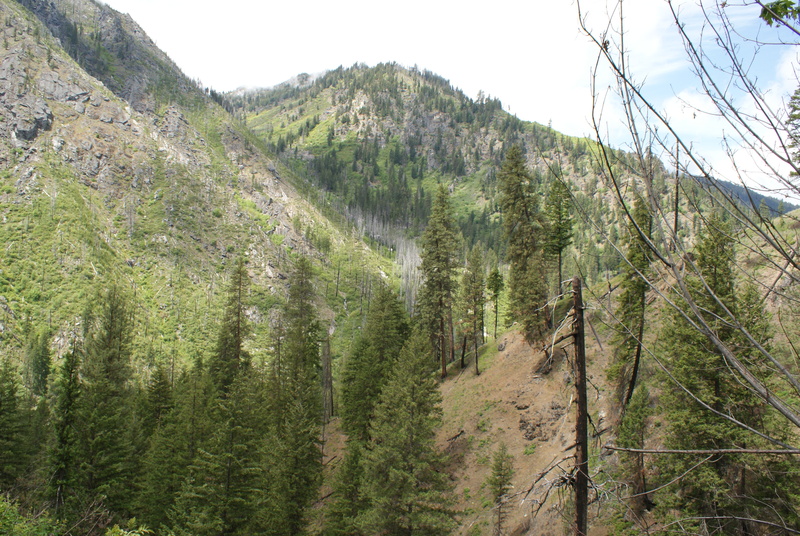 Upward we trudged, gaining views of the canyon and Wenatchee River below. Black-headed grosbeaks, chickadees, and many other birds serenaded us. Butterflies flitted ahead, just out of reach. We found a really cool, sparkly rock. Cliffy outcroppings gave me hope that we were nearing the area of the Tweedy’s, and sure enough, around another bend we spotted a couple of plants about 15 feet above us. 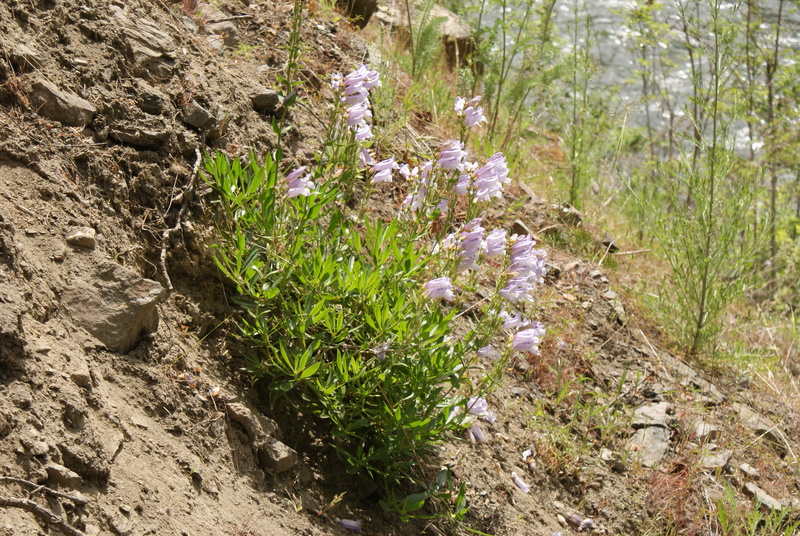 They were in bloom still, but we couldn’t safely clamber up the steep, loose slope to get a closer look. I was happy we had found the flowers, but was hoping there would be more close by. The kids by this point had had enough of this hike, and we turned around and headed back down to the car. A hummingbird made a brief appearance, and Jessie saw a vibrant blue bird flit across the road. 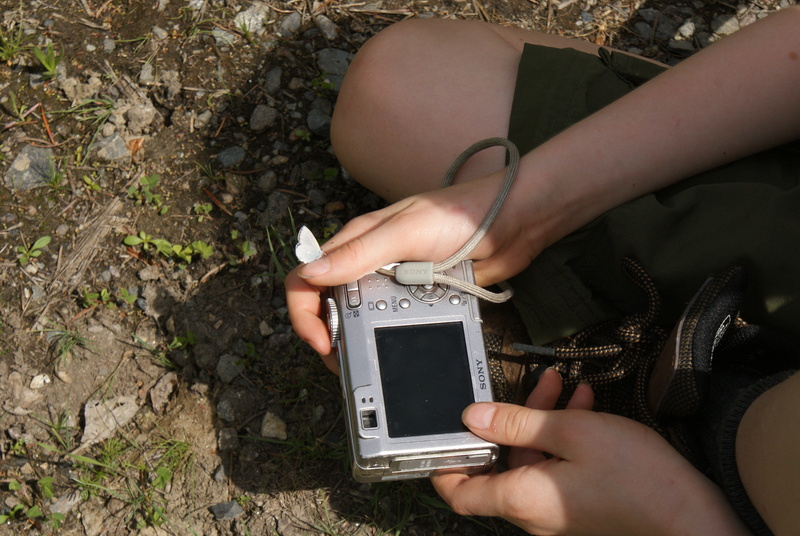 If I knew more bird songs I could have identified more of the beautiful songs we were hearing all around us. 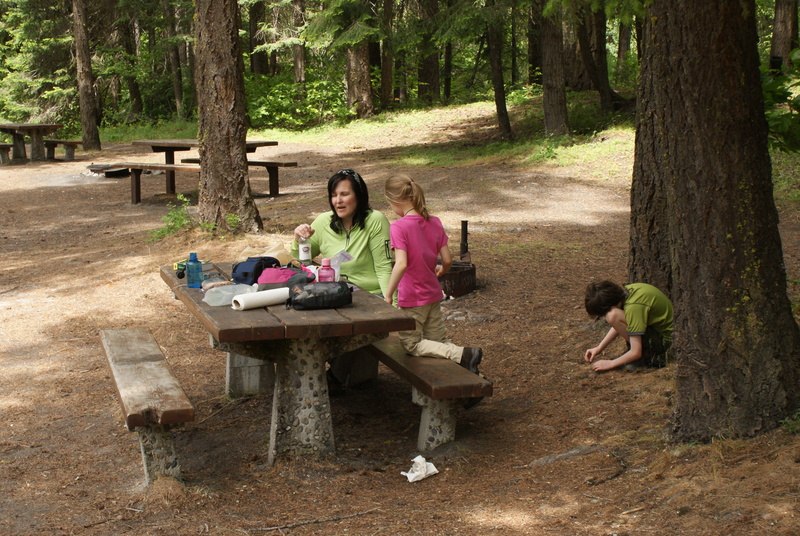 After we made it back to the car, we drove back to the Swift Water Picnic Area to have lunch and use the outhouse. There are some nice picnic tables near the river, and it makes a lovely place to stop and play. It looks like later in the season there might be places to play in the water, but the river was rushing so wildly that I didn’t want my kids close. I took a look at Annika’s foot, and she had gotten a blister. I patched her up and hoped it wouldn’t cause her pain for the rest of the day. Next it was time for the real hike we had planned for the day, based on a recommendation again by Alan Bauer. 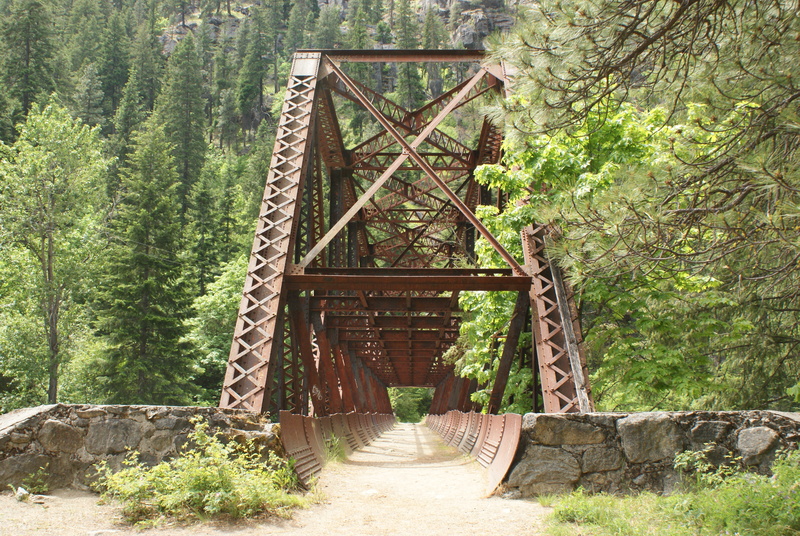 The Tumwater Pipeline Trail is 5 miles east of the Swift Water Picnic Area. There is a dedicated parking area off the highway next to the river, with pit toilets. It felt really hot there, and we were sweating and slathering on sunscreen. Gabriel was sleepy and didn’t want to hike, but I figured once we got moving again he’d be OK. Jessie had a thermometer app on her phone, and it said it was only 66 degrees. We had a hard time believing it could feel so hot and chalked it up to the humidity. 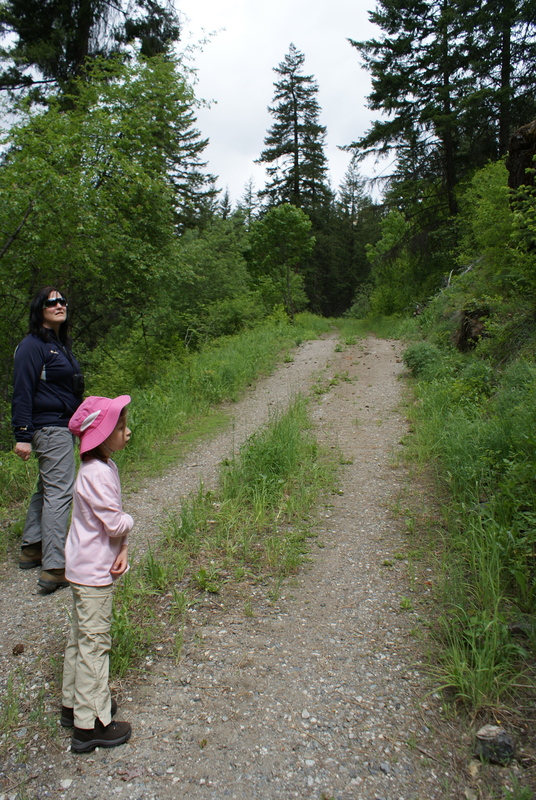 The Tumwater Pipeline Trail follows the route of a pipeline used in olden days to generate electricity for electric train engines running through the valley. The bridge that hikers now use to cross the river is the giant pipe cut in half and filled with dirt to make a level surface. 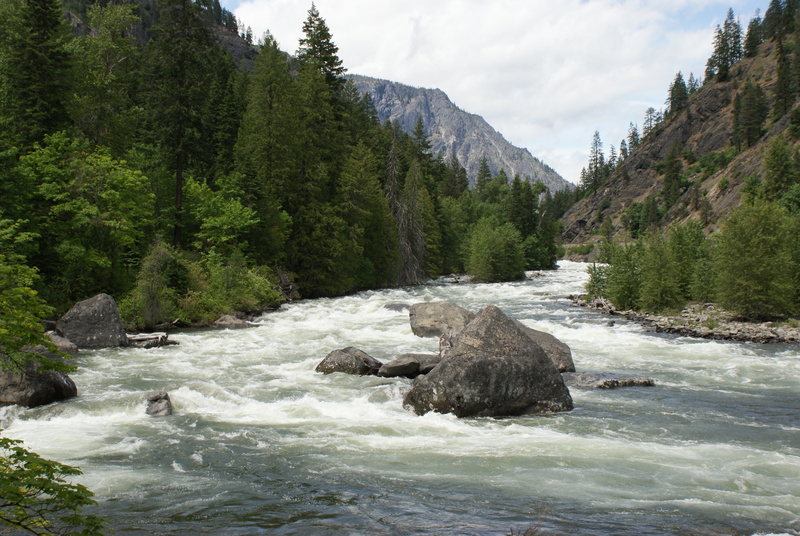 It is quite an experience being over the Wenatchee River as it tumbles down the canyon, whitewater rushing and roaring. Annika noticed triangles in the architecture of the bridge, applying knowledge she learned in her Engineering class. Once we crossed over the river, the air was cooler and more pleasant. The trail is gentle and soft, with lush bushes lining the path. 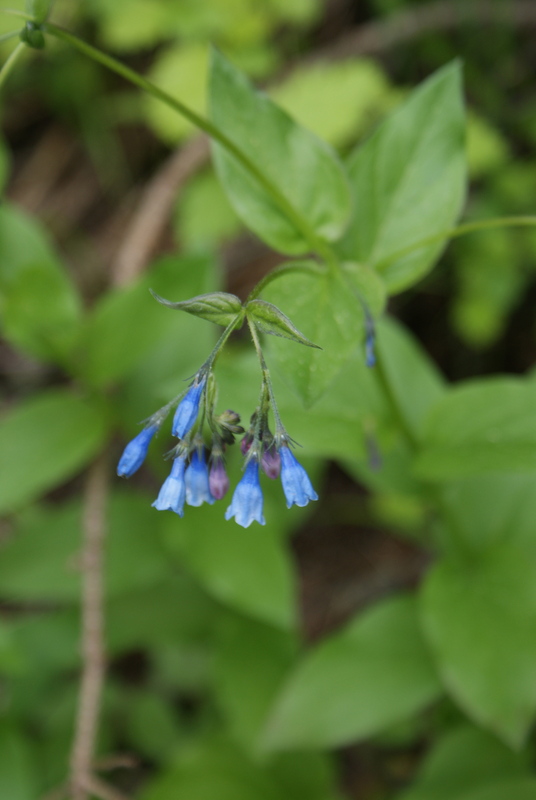 We had multiple stops for flower photography, and crossed a gentle brook at one point that leaked water on the trail for a few hundred feet. Our forward progress was stopped soon by a rushing stream with 3 logs thrown across to walk on. 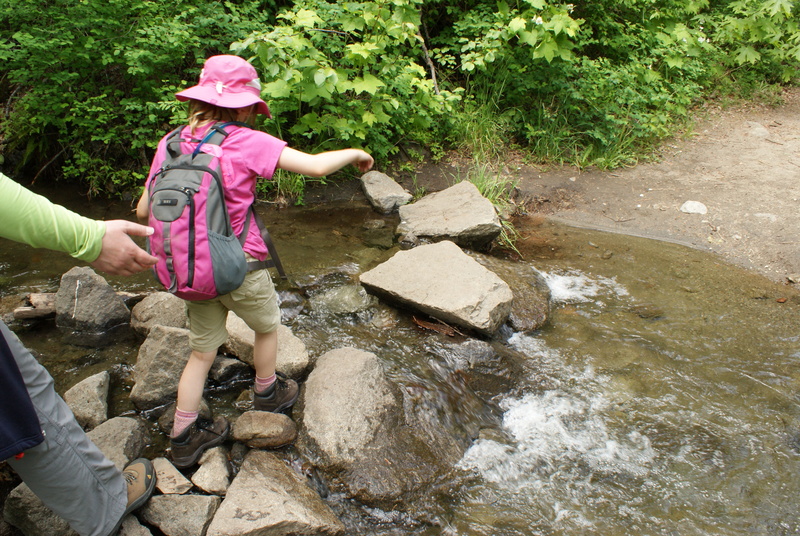 Neither of the kids felt confident crossing this stream, so we decided to stop there to play and have a snack. 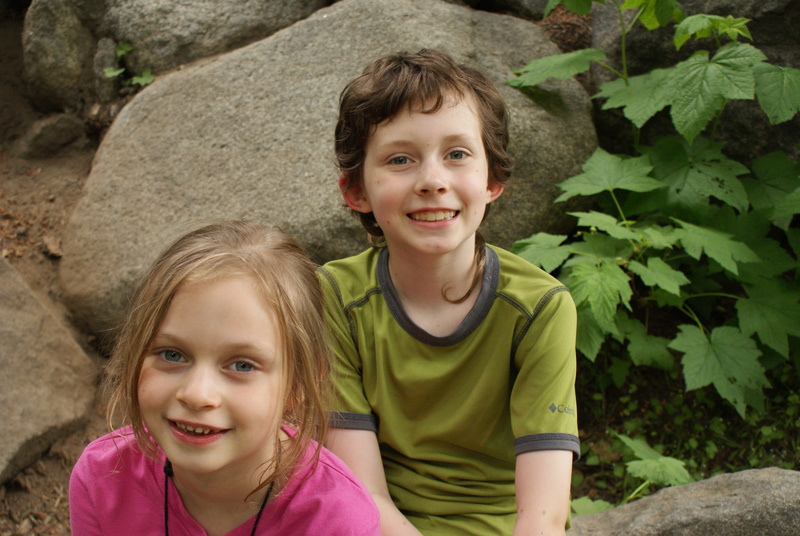 They climbed around on rocks and trees. Gabriel had renewed energy by this point. After a bit, he decided he wanted to try crossing the creek, so Jessie went along behind him. He did just fine, and practiced crossing back and forth. Annika was emboldened by Gabriel’s success, and went with Jessie holding her hands. She was so happy and proud when she reached the other side. 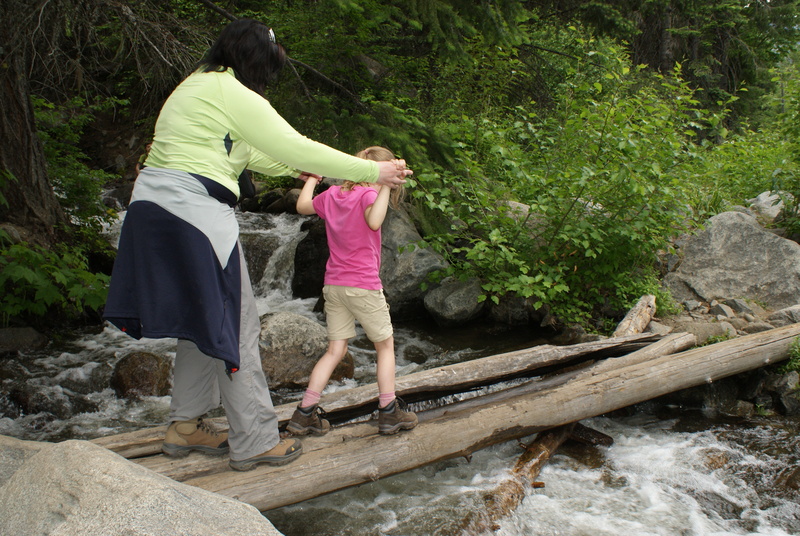 Taking small risks is one of the cool things about hiking with children, and can lead to increased independence and confidence throughout their life as they draw from the memories of challenges overcome. I dispensed three bandaids at this stop. I had given out one before we left the house, so with the addition of taking care of Annika’s blister, I made a mental note to re-stock the first aid kit when we got home. We thought we’d head back toward the bridge and hang out by the river for a bit. There aren’t very many places to access the river along the trail, but at the base of the bridge is a path down the bank and a relatively safe place to play. While we were there, some darker clouds blew over, dropping some raindrops on us and providing a cold breeze. It was time to pack up and head back to the car. 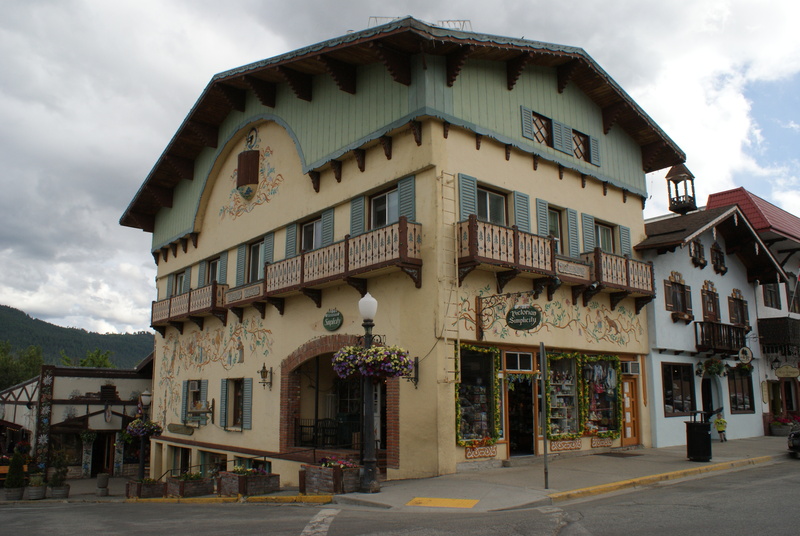 We loaded up and went into Leavenworth for a quick stop for coffee to get us home. They were having an art show in the main area, so we walked around and looked at art while the kids finished their drinks. Then we headed back west, enjoying the last of the sunshine and driving back into the grey. It was a good day. It’s like hitting the reset button on my brain. I’m so thankful for Jessie coming along, being so cheerful and helpful and great with my kids. We look forward to many more adventures together this summer. Get more trail details in Day Hiking: Central Cascades by Craig Romano and Alan Bauer. See our trip report on nwhikers.net. 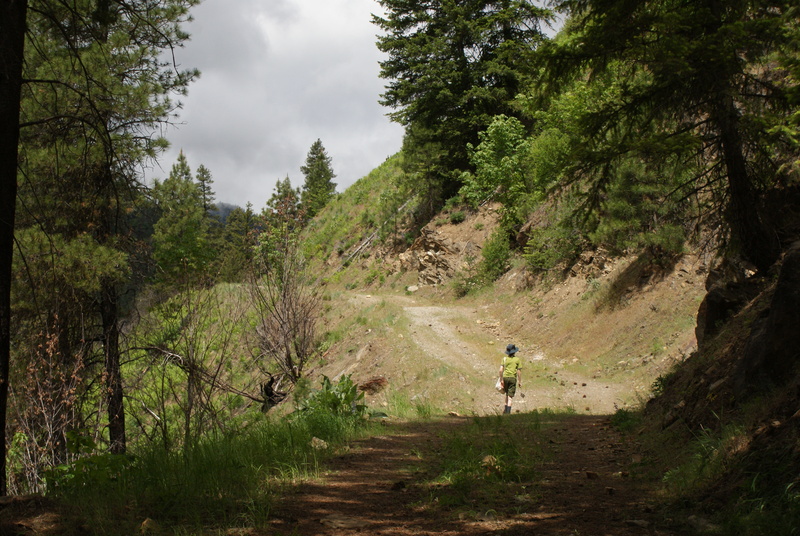 Karen Sykes wrote about these trails in the P.I. : Link Here. 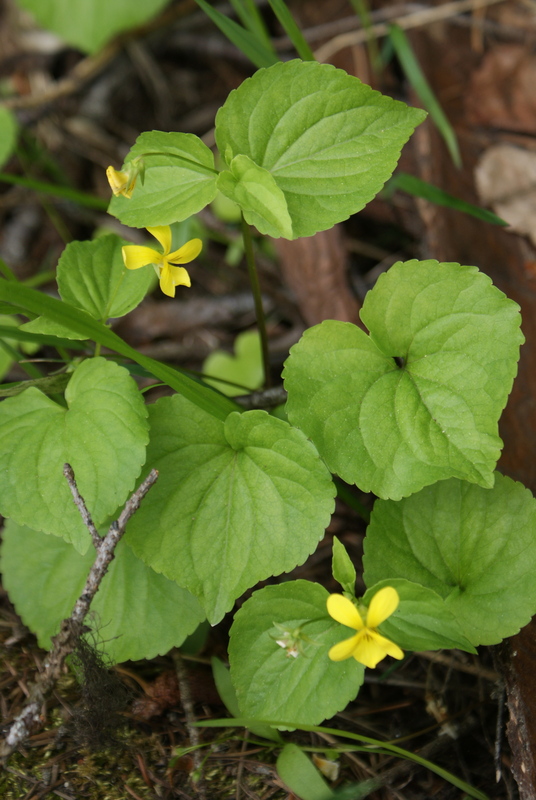 Read about one of the native endangered plants here. 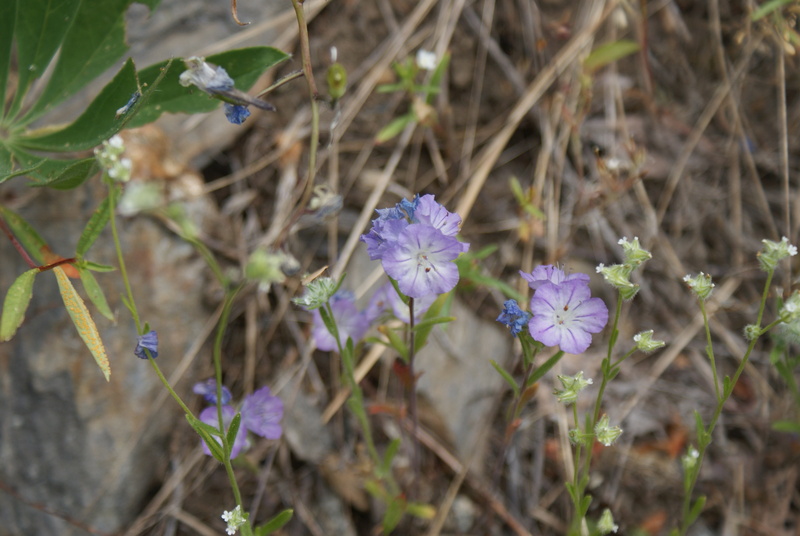 Read what Alan Bauer has to say about Tweedy’s Lewisia. 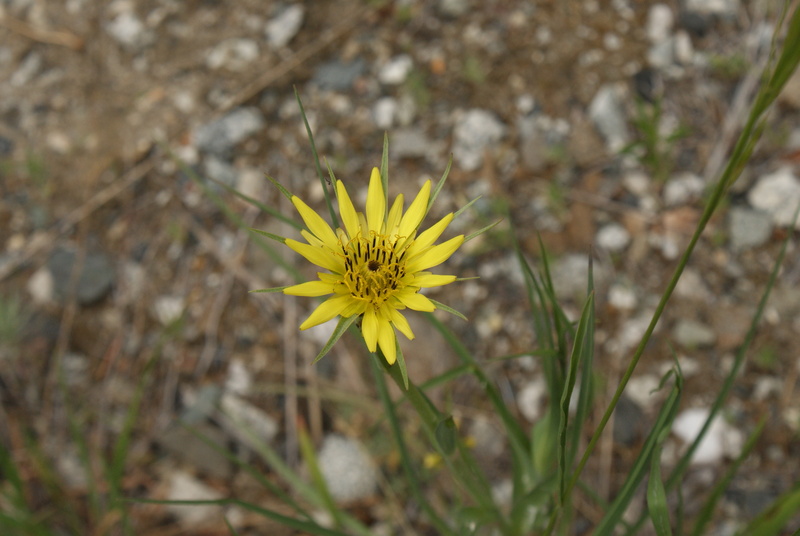 Use an online field guide for flowers in the Wenatchee area. Love your blog!!! Thank You so much for sharing so many beautiful hikes & regions of the PNW! 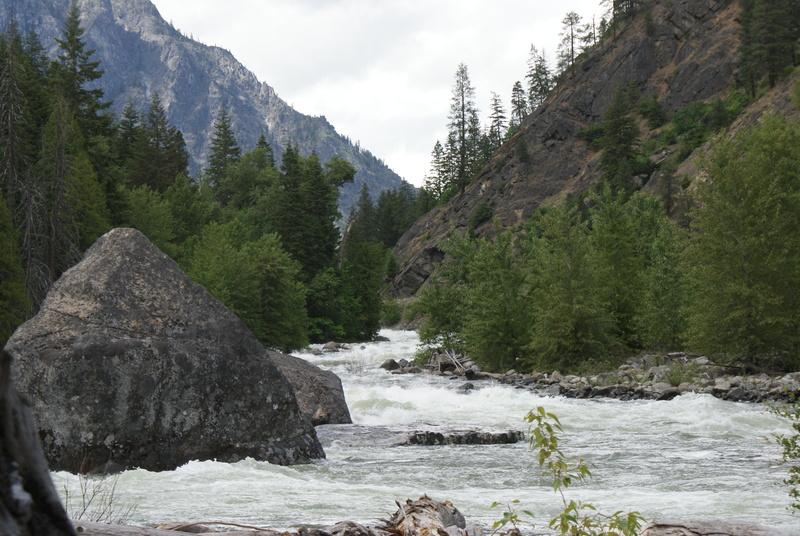 Do you have any other Leavenworth area hikes you could recommend as well? 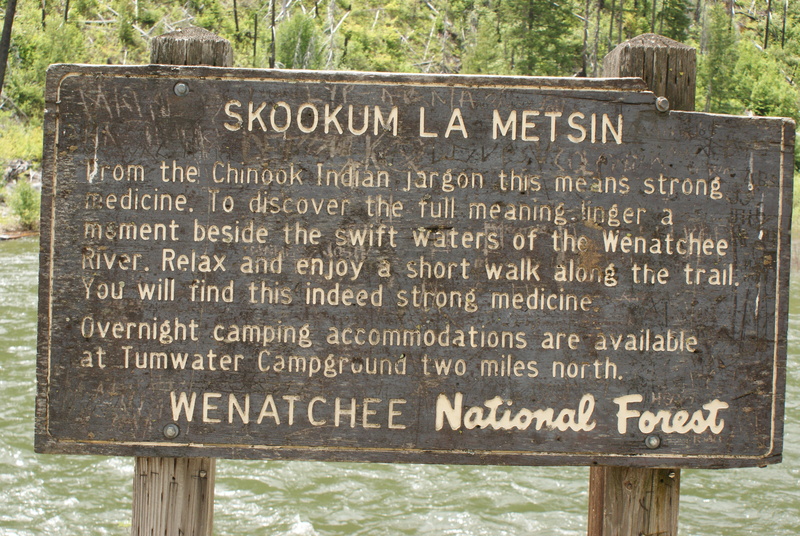 We are doing an extended camping trip this summer around there and would love to hear your recommendations for any other locations to not be missed. Thank You! Edited to add: I forgot, also, to point you to wta.org. 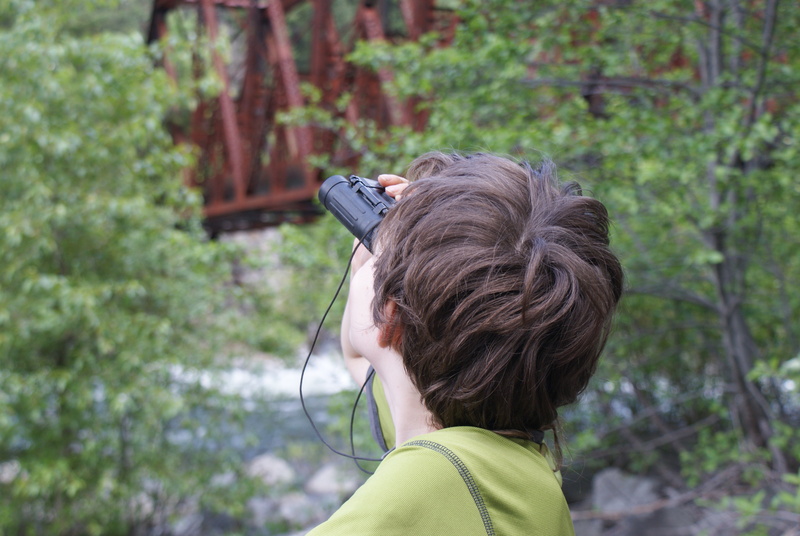 They have a neat feature where you can search for hikes based on area, and they also point out good hikes for kids. That’s one good resource I use when planning my trips. 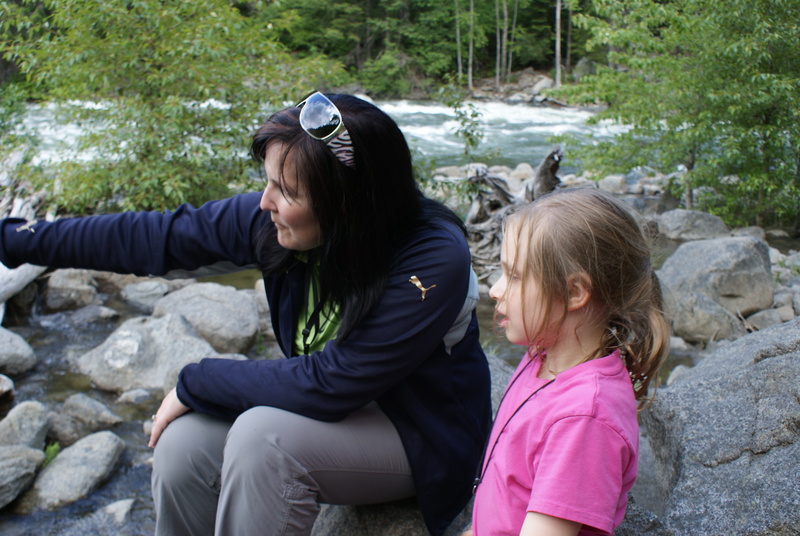 WTA also has an email newsletter you can subscribe to about hiking with children.